Guess what?! We just booked tickets to Europe for later this summer. Our plan: explore Barcelona, eat as many tapas as our bellies can hold and then drive across the border to France to eat as many French-everything we can. Oh, and to see the sights. I just can’t help it as our vacations revolve around food. Isn’t that best (um, only) way to experience a culture? What I love about Bonne Maman is that they preserve fruits at their peak, so the natural sweetness and fruit flavors really come out. They are also non-GMO project verified, use no high fructose corn syrup, no artificial coloring, and no preservatives. That's a lot of wins in my book. 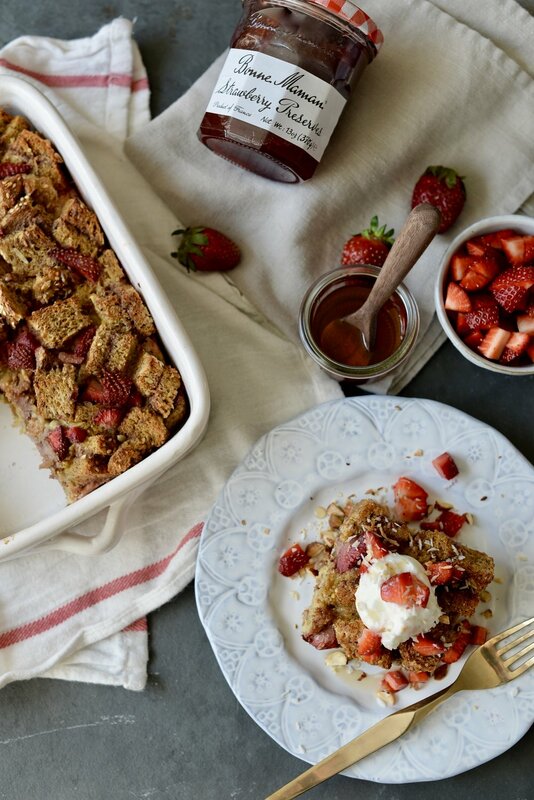 In this bread pudding, to make sure every single bite has a punch of strawberry, I make strawberry preserve sandwiches and cut them into cubes. Those cubes get tossed with fresh strawberries and bathed in an egg and almond milk mixture. After soaking overnight and baking in the morning, each slice is topped with toasted almonds, coconut, and coconut whip (or real whipped cream or Greek yogurt if dairy-free isn’t your thing) and drizzled with maple syrup. What better way to celebrate spring and the best Mom in the world? Grease bottom and sides of 1 ½ quart baking dish. Make preserves sandwiches. Spread 5 slices with 1 tablespoon each of Bonne Maman Strawberry Preserves. Top with another slice to make a sandwich, pressing gently to adhere. Slice each sandwich into 16 cubes. Spread half of cubes in bottom of baking dish. Scatter with half of chopped strawberries. Top with remaining sandwich cubes and strawberries. **Pudding can be baked immediately and the flavor will still be delicious, but the texture improves with an overnight soak as the bread softens in the egg mixture. This post was sponsored by Bonne Maman but opinions expressed are entirely my own. P.S. They are running an awesome giveway. Click below to enter! Over the past few weeks, I've had to opportunity to share some of my favorite healthy eating tips on my favorite store's blog. If you've been reading a while, you may know that I have a major crush on Terrain, Anthropologie's Home + Garden Store. It's got a pretty amazing online presence, but it also has the most beautiful store in Glen Mills, PA. It also has a super special place in my heart because it's where my husband and I got married last April. So, when they asked me to contribute to their blog in the spirit of wellness, I was so honored. In this third post, (my first and second are here and here), I talk about grain bowls. It's no surprise that I rely on them as part of my weekly pseudo-meal plan because they are so easy to throw together, are nourishing, and can go in all sorts of directions depending on what's in season and what I'm craving. In coming up with this particular grain combo was inspired by these gorgeous nesting bowls Terrain has in their store now. Seriously, I want a whole set of them. Maybe two. They're beautifully rustic and glazed in earthy hues. I wanted to create an equally rustic salad, but with bright flavors, and colors that would complement the blues and naturals. Citrusy with a salty punch and nutty finish, this salad is one for bookmarking. I made it three times in two weeks because I couldn't get enough. I think you're going to love this. 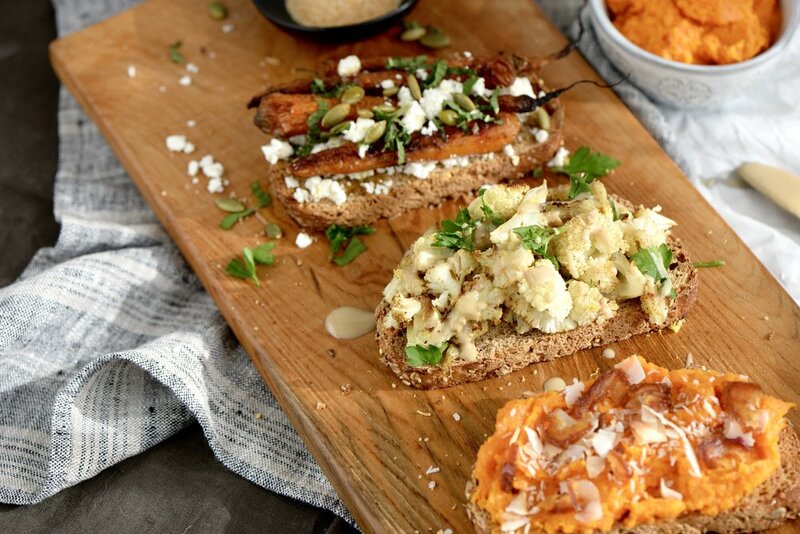 Head over to Terrain's blog to check out the recipe! And if you're wondering, this post is in no way sponsored. I just love working with a company that's putting out some amazing things. Oh, and the photos? Those were shot by the talented Katie Hennessey for Terrain. When I was in high school, one of my favorite things to do with my girlfriends was to go to Panera, order chai, and sit by the fireplace...oh, and gossip. Yeah, we weren't above that. We felt like such cool kids / pseudo adults sipping from our giant mugs like we had nothing better to do. As the temperatures drop, I find myself craving those same cozy flavors and warming spices (and fireplace chats). I also find ways to mix up my usual cold overnight oats with something a little less chilly. I took chai spices—cinnamon, ginger, cardamom, and cloves—and put them in pancakes, another food that transports me back to when Bisquick pancake mix was our Sunday morning go-to as kids. These pancakes may be a whole lot more wholesome than those Bisquick pancakes, but they are just as comforting. 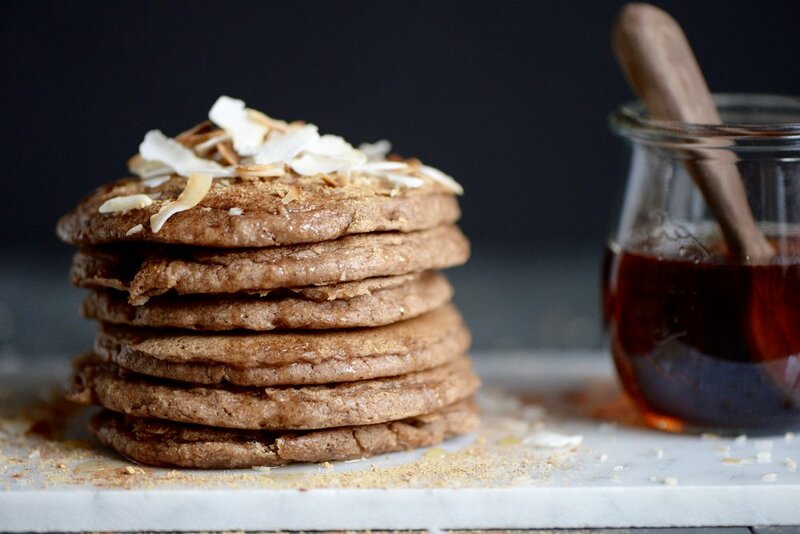 Sweetened with coconut sugar or maple syrup, they have a base of oat flour (I show you how to make homemade), whole wheat flour, and shredded coconut. They are slightly more dense than fluffy buttermilk pancakes or my Lemon Ricotta Pancakes due to the whole wheat flour, but you can lighten them up if you're not a fan of whole wheat flour by subbing more oat flour in its place. These pancakes are perfect for lazy weekends this winter or perhaps you make a batch and store them in the fridge to enjoy throughout the week as snacks. Make oat flour. Place oats in coffee grinder or mini food processor and process until it resembles flour. Mix oat flour and remaining dry ingredients in small bowl. In a larger bowl, whisk together egg (or flax egg), nut milk, maple syrup, and melted coconut oil. Slowly whisk in dry ingredients until combined. Preheat flat griddle or cast iron skillet over medium high heat. Add thin layer of coconut oil to coat. Add batter by ¼ cupfuls to griddle and allow to cook 2-4 minutes or until you see batter starting to dry out around edges. Flip and allow to cook for 2-3 minutes more. Remove from pan. Move to a wire rack and keep warm in a 200 degree oven if not serving immediately. Repeat with remaining batter, greasing pan with coconut oil as necessary. 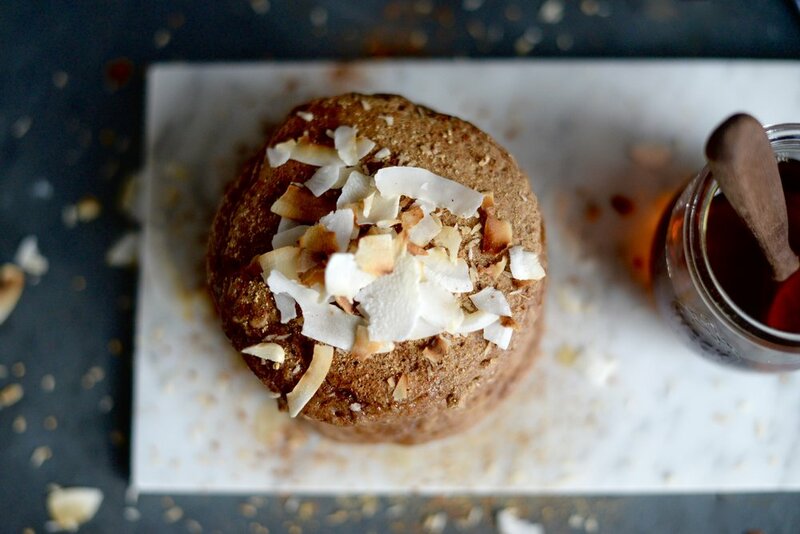 Serve with maple syrup, and toasted coconut. Enjoy! Makes 8-9 pancakes. I sort of contradict myself here calling this a plant-based egg nog because there are no eggs in this nog. There's also no dairy milk nor granulated sugar like in the traditional stuff. So where do I think I get the liberty to call this egg nog in the first place? Because this really does take like the real deal...with the same rich and festive taste, albeit lighter. In a good, still satisfying way. Not in the oh, this will suffice kind of way. And it has a pretty awesome nutrition profile if we're comparing things. I've tried making a plant-based nog in the past because the ingredient list of Silk Nog left a little more to be desired (caraggean and turmeric in your beverage, anyone? ), but my results were mediocre. One tasted too much like almond milk with spices and the texture was too thin. I thought coconut milk would lend a nice rich texture, but it tasted too much like well...coconut. Duh. I tried maple syrup but that was overpowering and coconut sugar, but it didn't wow me. I even tried throwing in frozen banana thinking that would give a nice creamy texture, but it resembled a smoothie too much. I consulted other recipes out there, but results were lackluster. All of the experiments were certainly edible, but they just didn't taste like the egg nog I grew up with. In the end, as much as I would love to get a recipe right on the very first go, all of this experimenting was worth it because I'm always learning something new about the potential and limitations of certain ingredients. That's why I am so proud of this recipe. Really, I am. Like I'd totally serve it to plant-based skeptics knowing that it tastes delicious. It took a lot of trial and error, but it's all worth it. Because I'm so excited about it, I'm giving away a box of goodies to one lucky someone who would like to recreate this delightful drink at home. To enter, comment below and on my Instagram post announcing the giveaway. The winner will receive all of the ingredients plus a handy-dandy nut milk bag(!) for future plant-based milk endeavors. Contest ends Monday, December 12 at 8pm EST. But of course, you can still make this at home even if you don't win. 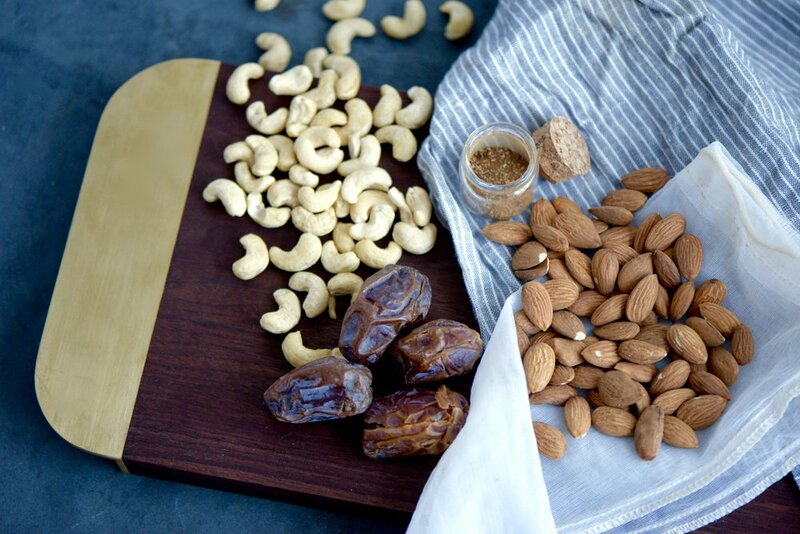 Cashews and almonds get soaked overnight and made into an almost-nut milk. Almost because it's going to be thicker than your average nut milk. Dates give a wonderful caramel note and also contribute a velvety texture. Cinnamon and vanilla are added for a festive touch, but not too much as to overwhelm, and the quintessential egg nog spice—nutmeg—goes into the mix as well. A bout in the blender and then chilled in the fridge, it thickens up even more. Don't forget to sprinkle a hefty portion of nutmeg on top either. It's all the merrier that way. Spike it with a little bourbon, drink it on its own, or sip it with some Christmas cookies—healthy ones, of course ;). Make nut milk. Add soaked nuts, water, and pitted dates to blender. Process on high for about 3 minutes. Mixture will get hot. Pour mixture through nut milk bag (or unused clean stocking or pantyhose!) into a bowl, squeezing excess liquid from bag until left with mostly dry pulp in bag. Discard or reserve for another use*. Return milk to blender (or just use a whisk) and add vanilla, ground cinnamon, generous amount of freshly grated nutmeg, and salt. Blend briefly just to combine. Taste and adjust spices. Pour milk into clean jar and allow to cool in refrigerator until well chilled. It will thicken a bit as it cools. Shake jar before serving, and top with an extra sprinkling of freshly grated nutmeg. Mixture will last 3 days in the refrigerator. Makes about 3 ½ cups.